Home | Engaging in Trade Policy Transformation this World Fair Trade Day! Engaging in Trade Policy Transformation this World Fair Trade Day! Wouldn’t it be great if public policies benefited the public, so everyone could prosper, and so-called “free trade agreements” valued our precious resources rather than exploiting people and the planet? As consumers, we have the power to vote with our dollars, as well as to engage in local and federal policy reform in order to help change and transform our global economy to protect our people and planet. World Fair Trade Day (WFTD), May 10, 2014, is a wonderful time to be inspired by the great work that many mission-driven companies are doing to support a just economy. While governments and transnational companies favor corporate globalization that benefits only the top 1%, creating larger economic gaps between the rich and poor, you can feel confident that when you purchase products from our WFTD partner brands (Alaffia, Alter Eco, Canaan Fair Trade, Divine Chocolate, Dr. Bronner’s Magic Soaps, Equal Exchange, Farmer Direct, Guayaki and Maggie’s Organics), these ethical businesses put people and the planet before profits. Purchasing their products is a first step towards an ethical and sustainable marketplace. Fair World Project is calling on civil society to go beyond marketplace action and the power of ethical purchasing to engage in the political process. There are several ways to engage, such as signing online petitions, writing letters to Congress, and organizing events in your community to boycott big transnational companies that put profits before all else. It is only when the values of our market initiatives and our public policies match that we will see true transformation to a just global economy which puts people and the environment before profits. “Free trade” policies, for example, generally harm small-scale farmers. After the passage of the North American Free Trade Agreement (NAFTA), more than two million small-scale corn farmers in Mexico were forced off their land, as highly-subsidized U.S. corn flooded the market, decimating local rural economies and forcing hundreds of thousands of people to migrate. Reports show that incomes have dropped for most farmers in North America since the implementation of NAFTA. A new, broader agreement called the Trans-Pacific Partnership (TPP) is expected to have similar effects on farmers in the twelve participating countries. In addition, the U.S. Farm Bill allows subsidies for large-scale farmers. For example, U.S. cotton subsidies totaled $32.9 billion from 1995–2012. Because of these subsidies, small-scale cotton farmers in the Global South are forced to compete in an unequal global market. Impoverished cotton farmers in four West African countries have been internationally recognized as victims of trade injustice due to the effects of U.S. farm policy. Unfortunately, some brands take advantage of fair trade marketing niches, “fairwashing” their image, while continuing to passively support — or even actively advocate for — unjust policies that actually harm farmers. For example, Nestlé markets its “Partners’ Blend” coffee as 100% fair trade, representing a very small percentage of their total sales, with the vast majority of their coffee being conventional, “unfair” coffee. Nestlé is a member of CropLife and the Grocery Manufacturers Association (GMA), both of whom have lobbied in favor of free trade policies. Starbucks even has a representative on the advisory committee guiding the U.S. negotiations on the TPP, one of the elite 600 corporate advisors who have been granted access to the secret text. Oxfam America, in a comprehensive study of the top ten food companies in the market (www.behindthebrands.org/en/~/media/Download-files/bp166-behind-brands-260213-en.ashx), has noted that Nestlé does not support farmers’ organizations, does not insist that suppliers do business fairly, and has not committed to zero tolerance for land grabs. Nestlé, and companies like it, may point to their fair trade products as “proof” of their support for small-scale farmers, while behind the scenes they promote policies that are very harmful to farmers, workers and consumers. That is why Fair World Project is working with dedicated brands on WFTD — brands that are committed to a holistic vision of fair trade that supports small-scale farmers every step of the way. Fair World Project started the WFTD retailer initiative to bring awareness to consumers that their purchasing dollars can make a real difference. Last year was a great success, with over 850 natural product retailers signing on to offer their consumers discounts on products produced by our WFTD partner brands. This year the retailer initiative continues during the first two weeks of May, with retailers around the country offering discounts from our nine partner brands to celebrate WFTD. 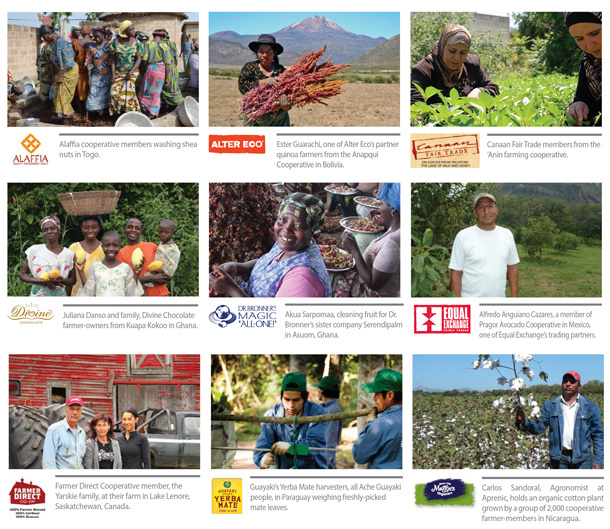 Fair World Project supports these partner brands and others like them, advocates for just policies and insists that brands not fully committed to a just economy continue to improve their practices and make only authentic claims of fairness. Visit our campaign page to find out ways that you can take action to push brands to act more fairly, advocate for fair policies and support the pioneering brands that are leading the way to a truly just economy.